Dave has played the Highland bagpipes and saxophone playing Irish and Scottish Traditional music and Jazz with many other artists in the past such as Carl Douglas ,Manfred Mann, Joan Armatrading, Graham Bond, Elkie Brooks etc.He has also worked and played the bagpipes on the alternative comedy scene with Arnold Brown, Malcolm Hardy, John Hegley, Marcel Steiner and Keith Allen. 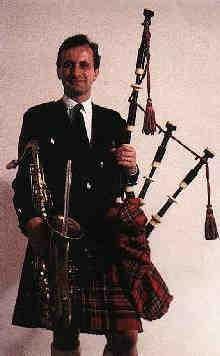 In addition,he has also performed as the bagpiper in the London production of 'Brigadoon' and the BBC production of 'People Like Us'. And released 3 albums of his own playing bagpipes, saxophone and flute.